The Italian sheep dog: a dog breed selector for the Bergamasco. is this Italian sheep dog for you? This is a brief guide to the Bergamasco, one of the most popular of the Italian sheepdog group, including its history, purpose, temperament and care. Please bear in mind that if you are serious about buying this - or any - type of dog you need to make sure you get proper breeding and veterinary advice. Many animals we think of as belonging to a particular country did not necessarily originate from there, and the Italian sheep dog breeds are amongst those. This breed is most likely to be descended from the herding dogs of the Middle East, originating there something like seven thousand years ago and brought into Europe by the nomadic shepherds of Persia (now Iran). Used for generations to protect sheep from wolves, these large herding and flock guarding dogs have been an important part of life in Italy since the times of ancient Roman animals and remain a crucial part of life in rural Italy today. Mentioned by Varrone, a Roman Consul and philosopher, in 116 B.C., the Bergamasco dog migrated with the shepherds of the mountains between Iran and Turkey to the Alps of northern Italy where it settled and bred, known as the 'Pastore delle Alphi'. But as industry spread and tourism became more important than sheep in the Alpine region the Bergamasco was used more and more infrequently and by the 1940s had nearly become extinct. The breed was saved only by one or two kennels in northern Italy, most notably the farm of Piero Rota in the Bergamasche valley - hence the name 'Bergamasco'. 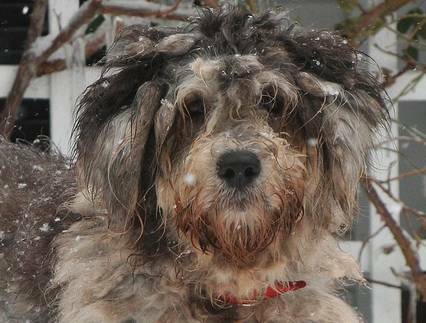 These breeders wanted to preserve one of the original Italian dog breeds and, although it is still not a common sight, the Bergamasco dog has become popular not only in the north of Italy but also in Canada and America where it was first registered in 1998. The tangle-haired stage : a juvenile Bergamasco. Courtesy of the International Bergamasco Sheepdog Assoc. A rugged dog for a rugged region, the Bergamasaco is a medium sized, squarely built Italian sheep dog weighing around 70 lbs (about 38 kilos) and standing about 23" (60 centimetres) tall. 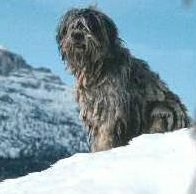 His most notable feature is his hairiness : the very long, dark coat looks matted as it falls to the ground but is a necessary warming fact of life for an Alpine sheepdog, and the hair over the eyes is left long to protect the dog from snow-blindness. Despite his shaggy locks the Bergamasco dog does not moult and under his hair is hidden a trim, athletic, very robust and healthy animal with no problems caused by breeding. With a patient, tolerant, protective nature this Italian sheep dog will tend to bond with one person particularly, but if kept as a family pet will link with each member of the family in a different way and will be particularly protective of children. A quick learner with amazingly acute hearing, an independent, self-sufficient problem-solver able to make decisions without any human guidance, and a lover of open spaces, it's not surprising that the Bergamasco is a member of the herding dog class. ... to this : an adult Bergamasco with the distinctive 'flocks'. Another one of those unusual animal facts from Italy concerns the Bergmasco: he is the only dog whose coat is made of three types of hair. From the soft, fluffy puppy coat it grows to an undercoat of fine, oily hair which forms a protective layer, covered by thin grey harsh strands like the coat of a goat, and finally a woolly topcoat. These last two weave together by the age of about three to form the distinctive dreadlock look, or 'flock', for which this most curious of Italian dog breeds is famous. 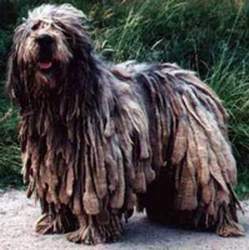 The Bergamasco, however, is not the most popular of the Italian sheep dog family. That honour goes to the other well-known Italian sheep dog - the Maremma. So, the big question : is this Italian sheep dog right for you and your family? Here's how to tell. How much does the Italian sheep dog cost? 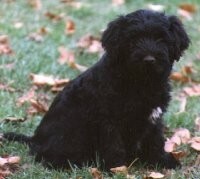 The Bergamasco is classed as a rare dog breed and is therefore expensive to buy. A puppy from an authorised breeder would cost something upwards of 600 Euros ($900, £525). It is a large, long-lived dog so the cost of food and veterinary bills for their lifespan of about fifteen years must be taken into account. If you decide this large sheep dog is just too big for you, have a think about the Spinone or Italian Griffon which is equally active but smaller and easier to handle. Does the Bergamasco make a good family pet? The Bergamasco will adopt a family as his 'flock' if he has no other animals to guard and will protect each family member, if necessary to the death. That can be a problem when visitors come to your house - the Bergamasco might not take too kindly to intruders on the premses. This dog should be treated with respect and is really a breed for experienced owners only. Absolutely not. The Bergamasco loves open spaces and will become frustrated with a routine lifestyle. He needs an absolute minimum of an hour's free running exercise each day. His thick coat, which makes him ideally suited to mountain climates make him equally unsuited to centrally heated houses. Problems with the Bergamasco dog's coat can develop into eczema if he is washed and not properly rinsed. Having said that, in terms of coat care the Bergamasco does not shed and needs less grooming than its looks suggest. But he has a woolly undercoat and is unsuitable for families where there is any form of allergy to wool. Finally, although very placid, their role as guard dog makes them prone to barking when they perceive intrusion into their 'flock' - which is unlikely to go down well with city neighbours. If you want a dog for the city, have a look at the miniature greyhound - an ideal dog for a small space. The Italian sheep dog is at his happiest when working and is one of the best livestock guardians in the world. Whether the work is guarding large flocks of sheep or goats or a few chickens, everything which makes these Italian dog breeds a less suitable city house pet at the same time makes them an excellent guardian. The Bergamasco is not yet registered by the Kennel Club of Great Britain and therefore is as yet ineligible to enter Crufts, although it is a recognised rare breed for showing in Italy, Canada and the United States. Like to know more about the Italian sheep dog? Here is the definitive book to read. Maria Andreoli and Donna de Falcis. Published Kennel Club Books Inc., April 2004. A comprehensive guide to this rare breed of Italian sheep dog including history, how to choose a healthy puppy, breed standard and characteristics, everyday care, health, training, showing the Bergamasco, and how to care for the older dog. Maria Andreoli is the founder of the famed Dell'Albera Kennels in Italy; Donna DeFalcis was the first American breeder of the Bergamasco. This book provides everything a new owner needs to know about acquiring and looking after the Bergamasco, from two of the foremost experts in the field. 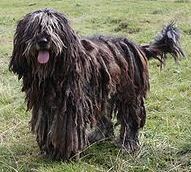 If you're thinking of buying a Bergamasco dog, buy this first!